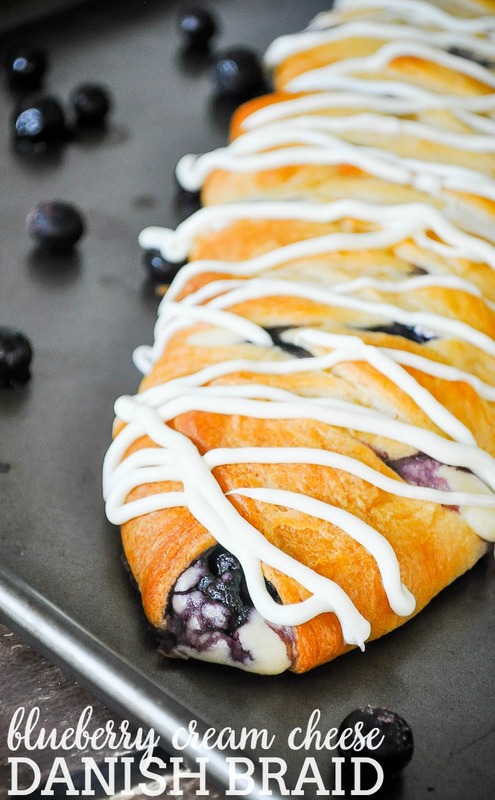 Delicious and creamy Blueberry Cream Cheese Danish Braid! Many people look back on Christmas as a kid and remember the gifts. Bryan can clearly tell you the best gifts he got for Christmas, how old he was, the time he spent with it if it was a toy. They are vivid memories to him. Me? Those are not the aspects of Christmas that stand over to me. Sure there is the Christmas where I got a Crimp and Curl Cabbage Patch and watched my brother play with it more than I did, but it’s the family moments and decorations that stand out. It’s helping Dad put up the Christmas village or string lights up outside. It’s baking with Mom. It’s watching one of the movies we got for Christmas in the afternoon or playing games later into the night. 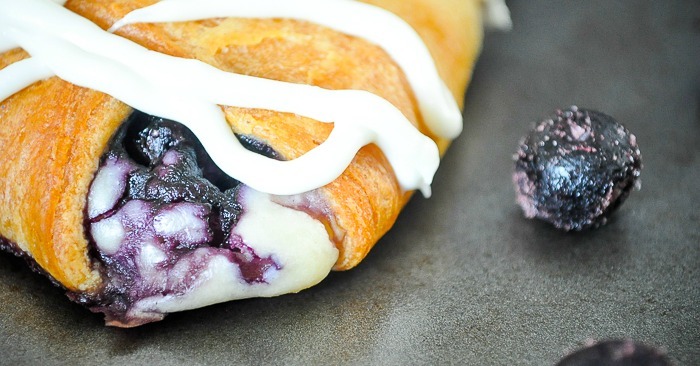 It’s Christmas morning breakfast with special treats like this Blueberry Cream Cheese Danish Braid. Every day of the year, I am a breakfast gal. During the holidays and on Christmas itself, I am breakfast obsessed because it’s a big full breakfast with delicious warm pastries. 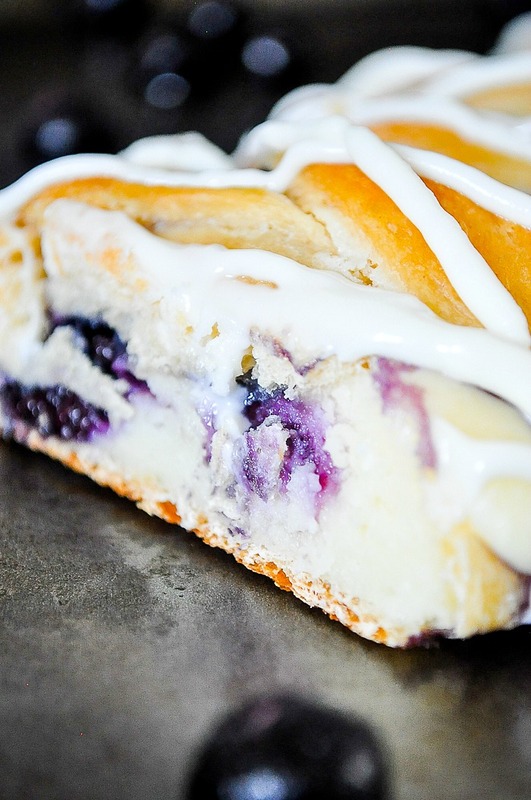 First, this Blueberry Cream Cheese Danish Braid has a rich, creamy filling. Every bite is a little bit of heaven for me. Then, the buttery, flaky crust that is made super easy thanks to Pillsbury Crescents®. Then of course the fabulous blueberries and a drizzle of white chocolate. Each piece is great on it’s own but together it’s perfection! Did I mention easy already? Good recipes do not need to be hard or complicated. 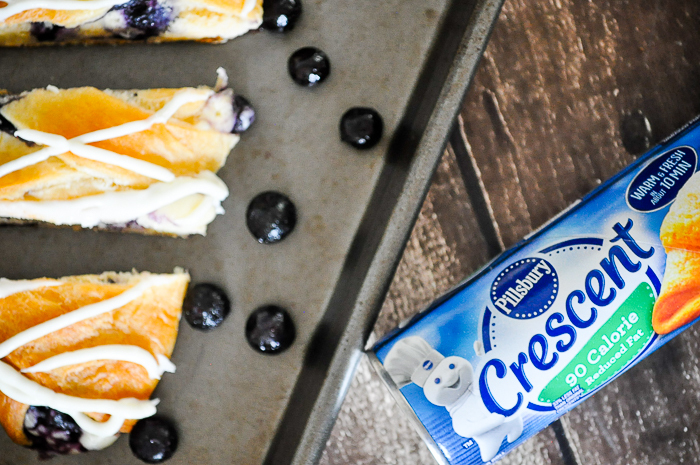 Pillsbury Crescents® make a fabulous crust for a danish braid so make sure you pick some up the next time you are at Walmart and head over to the site to see even more recipe ideas. In a small bowl, use hand mixer to combine cream cheese, sugar, flour and vanilla. Then set aside while you prep the crescent rolls. Open crescent roll dough and unroll, leaving the rectangles in tact. On the parchment paper, lay the crescent roll rectangles together (making the longest combination you can). Press edges together to seal any holes. Spread cream cheese filling down the center of the dough to be about 2 inches wide. Top with blueberries. Fold 1/2 inch dough pieces up over filling alternating sides to get a braided pattern. You will have excess dough once you reach the end of the danish which you will fold in the best you can. Bake for 15-20 minutes until filling is set and dough is golden on top. Cool before removing from baking sheet. Add either melted white chocolate on top or make a powdered sugar glaze for the top.